On this date in 43 B.C.E., the 63-year-old Roman statesman Cicero, fleeing the proscription of the Second Triumvirate, was caught and decapitated near his villa south of Rome. Arrogant, eloquent and opportunistic, Cicero was a polarizing figure in his forty years in the public eye. He was a Senator from an upstart family who espoused the conservative Republican cause, and a master rhetorician. Twenty years earlier, he had received the honorific Pater Patriae for steering the Roman Republic through the Catiline conspiracy. But not Cicero nor any other Roman had healed the social rot in which Catiline’s plot sank roots. The Republic continued to weaken even as Cicero poured out the volumes of rhetoric and philosophy for which later generations would celebrate him. Ironically, Cicero survived the resumption of civil war in 49 B.C.E. despite backing the losing faction; it was the (momentary) peace between Marc Antony and Octavian that doomed him: to consolidate power, the dictators proscribed numerous political rivals. 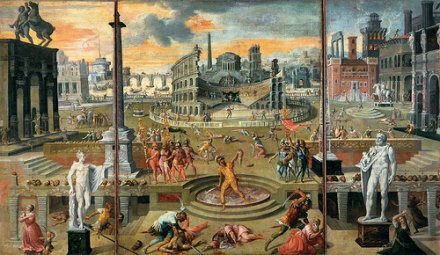 Massacres of the Triumvirate (1566) by Antoine Carn. Analysis (pdf). Cicero, a bitter nemesis of the assassinated populist Julius Caesar and his heir apparent Antony, was among the casualties. [H]is assassins came to the villa, Herennius a centurion, and Popillius a tribune, who had once been prosecuted for parricide and defended by Cicero; and they had helpers … Herennius hastened on the run through the walks, and Cicero, perceiving him, ordered the servants to set the litter down where they were. Then he himself, clasping his chin with his left hand, as was his wont, looked steadfastly at his slayers, his head all squalid and unkempt, and his face wasted with anxiety, so that most of those that stood by covered their faces while Herennius was slaying him. For he stretched his neck forth from the litter and was slain, being then in his sixty-fourth year. Herennius cut off his head, by Antony’s command, and his hands — the hands with which he wrote the Philippics. It would be too glib to say that the Republic died with him, for Cicero himself recognized that Caesar’s war had already fatally compromised it. When Antony and Octavian at length returned to arms to settle their accounts with one another, nothing but the pantomime would remain. After a bloody century, Rome had her peace at last. [T]he first example, prototype, and original of tyranny has been discovered by us in the history of our own Roman State, religiously founded by Romulus … We have observed Tarquin, not by the usurpation of any new power, but by the unjust abuse of the power which he already possessed, overturn the whole system of our monarchical constitution. The BBC’s In Our Time does Cicero in podcast form here.